Magnetometers are nearly ubiquitous in today’s world, fueling applications as diverse as medical diagnostics and self-driving cars. The most sensitive magnetometers, however, can only operate at extreme temperatures and in a shielded environment that isolates the sensor from ambient magnetic fields. Sonera Magnetics is developing a magnetometer that can operate at room temperature and in portable form factors with sensitivity comparable to the best magnetic sensors available today, dramatically increasing potential applications. 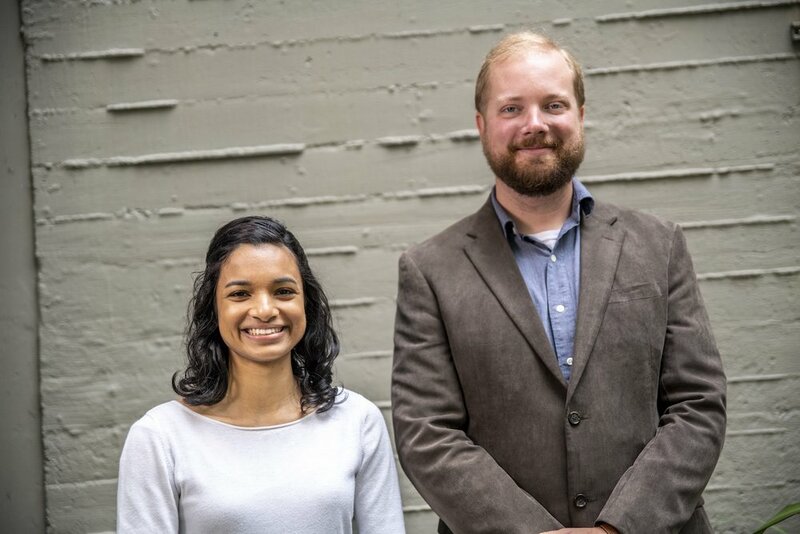 Dominic Labanowski and Nishita Deka met at the UC Berkeley during their graduate studies in the electrical engineering and computer sciences. There, they collaborated on the optimization and development of resonant magneto-acoustic devices with diverse applications including magnetic sensing, antenna miniaturization, and control of quantum systems. Labanowski earned his Ph.D. in electrical engineering and computer sciences from The University of California, Berkeley, and his B.S. in electrical and computer engineering from The Ohio State University. Deka is currently completing her Ph.D. at Berkeley and has a B.S. in electrical engineering from the University of Southern California. The most sensitive magnetic sensors today are superconducting quantum interference devices (SQUIDs) and spin-exchange relaxation free (SERF) magnetometers. In order to obtain high sensitivities, both systems require shielding to protect them from the effects of earth’s ambient magnetic field. To function, SQUIDs must be cooled to 4 Kelvin, whereas SERFs require heating above 150° Celsius. As a result such sensors require bulky and power-hungry infrastructure to operate, dramatically reducing their portability and increasing their cost. Significant development resources are being put toward solid-state magnetic sensing technologies to unlock promising applications for magnetometers in fields such as medicine, defense and computing. Despite these efforts, the most sensitive magnetic sensors today that can operate at room temperature and in the earth’s ambient magnetic field are still over five orders of magnitude less sensitive than SQUID and SERF systems. We are developing a magnetometer with performance comparable to the most sensitive technologies available today, but that can operate at room temperature and in earth’s ambient magnetic field. This sensor will enable solutions in a wide variety of markets, ranging from medicine to defense to brain-computer interfaces. Our core technology, based on acoustically-driven ferromagnetic resonance, is a magnetic sensor which leverages the strong interaction between GHz-frequency sound waves and magnetic thin films. This coupling enables a device with comparable performance to SQUID and SERF magnetometers, but that is capable of operating in ambient environmental conditions. Our first target for this new sensing technology is the medical industry, where the robustness and low cost of our sensors could dramatically improve access to powerful diagnostic tools like magnetoencephalography (MEG). Due to the high cost and infrastructure requirements of SQUID and SERF magnetometers, magnetically-based medical imaging technologies are typically large and expensive. As a result, such systems are quite rare when compared to other diagnostic equipment. The implementation of a system using low-cost magnetometers that can operate at room temperature and in earth’s ambient magnetic field could dramatically expand access to these powerful diagnostic tools. The ability to measure the extremely weak magnetic fields generated by brain activity in a portable and cost-effective device could also open the door to the first practical, non-invasive brain-computer interface—enabling people to control prosthetics or even robots with their thoughts. Such an interface could also enable safety applications, such as providing real-time information on individuals’ tiredness or level of concentration.